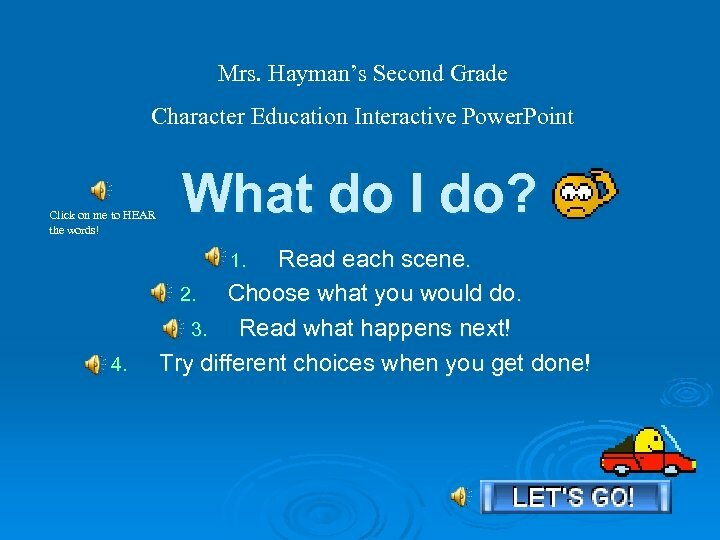 Mrs. Hayman’s Second Grade Character Education Interactive Power. Point Click on me to HEAR the words! What do I do? Read each scene. 2. Choose what you would do. 3. Read what happens next! Try different choices when you get done! 1. 4. SCENE 1 In the classroom Tony wants to borrow your new light-up pencil. He doesn’t have a pencil to use for writing. Tony sometimes loses things. You don’t want to make Tony mad, but you really love your new pencil. WHAT DO YOU DO? • Let Tony have your new pencil anyway so he doesn’t get mad at you. • Give Tony a different pencil and tell him that you want to use your new one right now. 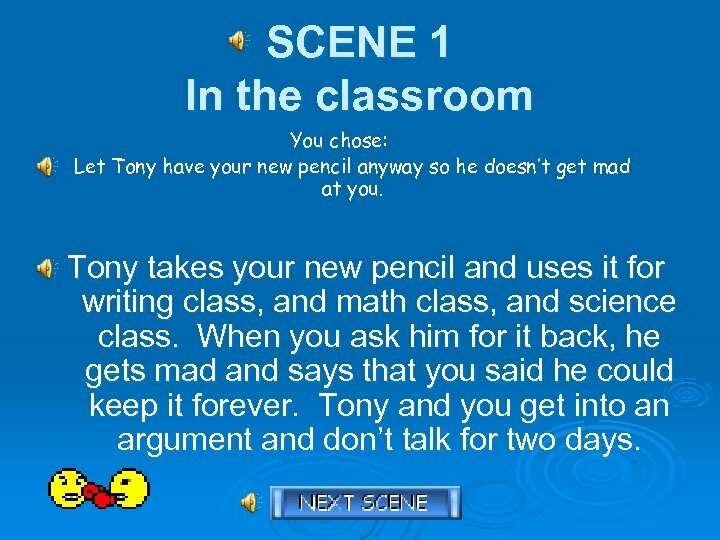 SCENE 1 In the classroom You chose: Let Tony have your new pencil anyway so he doesn’t get mad at you. Tony takes your new pencil and uses it for writing class, and math class, and science class. When you ask him for it back, he gets mad and says that you said he could keep it forever. Tony and you get into an argument and don’t talk for two days. 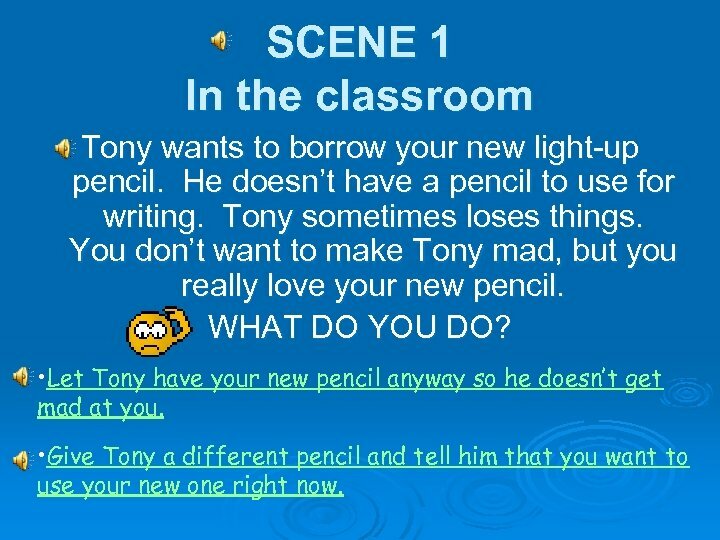 SCENE 1 In the classroom You chose: Give Tony a different pencil and tell him that you want to use your new one right now. 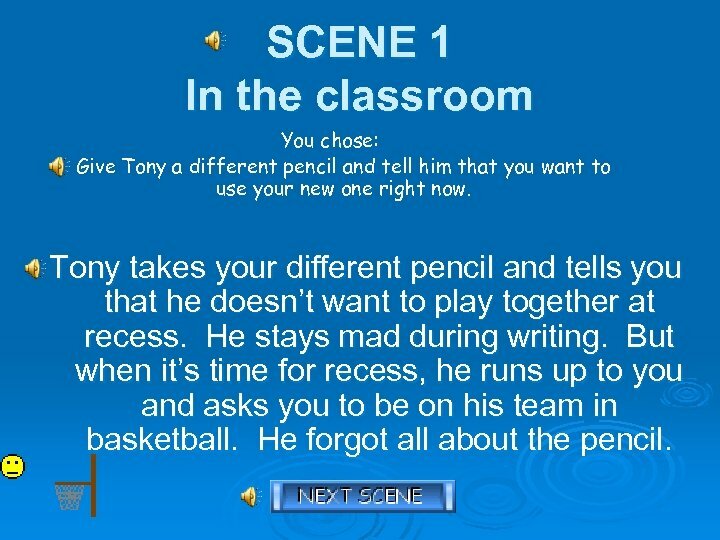 Tony takes your different pencil and tells you that he doesn’t want to play together at recess. He stays mad during writing. But when it’s time for recess, he runs up to you and asks you to be on his team in basketball. He forgot all about the pencil. SCENE 2 On the playground Jen plays with you every day at recess. You’ve been best friends for two years. Today when you get outside, Jen is playing with another girl. WHAT DO YOU DO? • Go ask if you can play with Jen anyway, maybe the other girl will go away. • Don’t play with Jen. She must want a new friend. 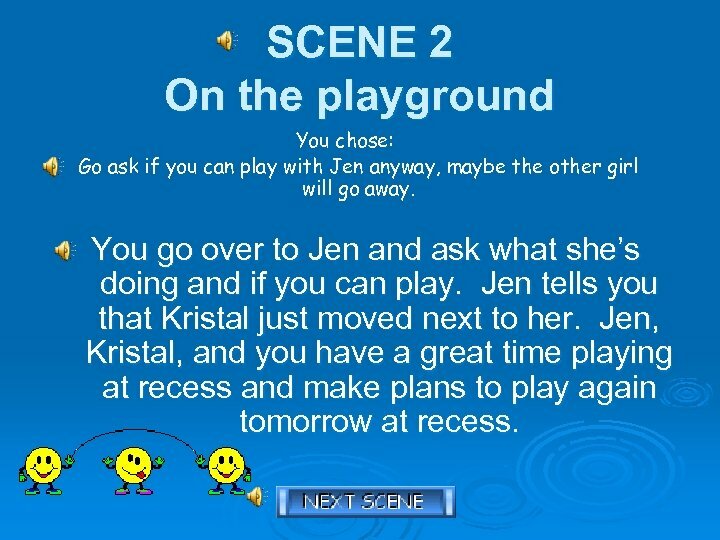 SCENE 2 On the playground You chose: Go ask if you can play with Jen anyway, maybe the other girl will go away. You go over to Jen and ask what she’s doing and if you can play. Jen tells you that Kristal just moved next to her. Jen, Kristal, and you have a great time playing at recess and make plans to play again tomorrow at recess. 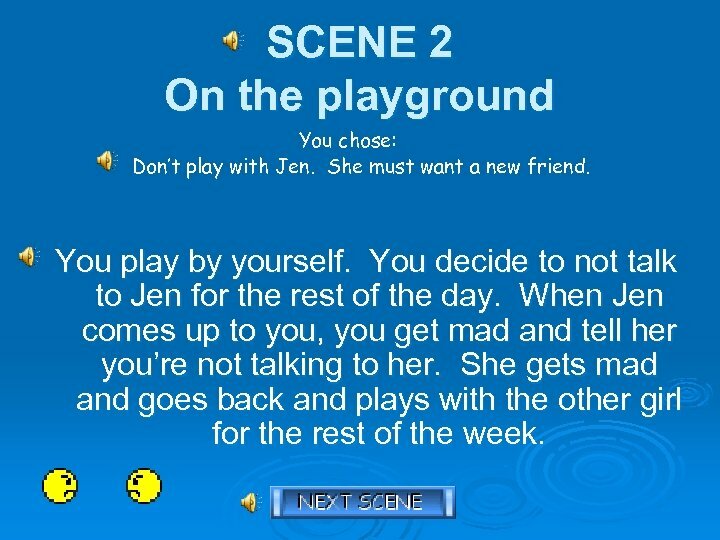 SCENE 2 On the playground You chose: Don’t play with Jen. She must want a new friend. You play by yourself. You decide to not talk to Jen for the rest of the day. When Jen comes up to you, you get mad and tell her you’re not talking to her. She gets mad and goes back and plays with the other girl for the rest of the week. 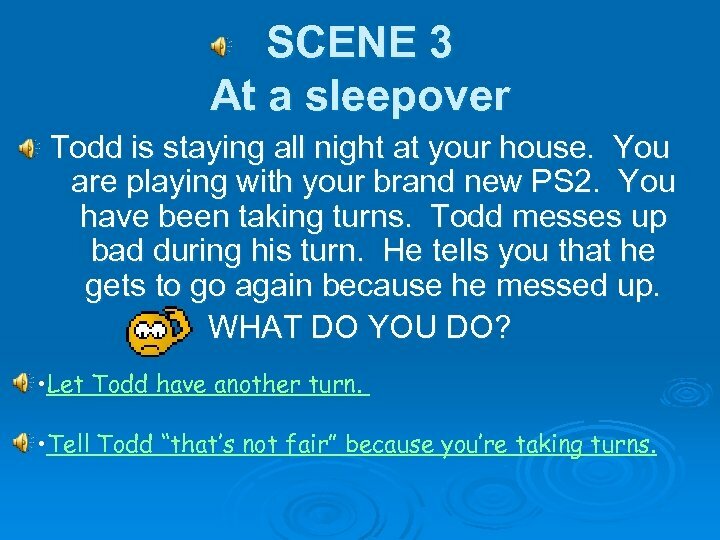 SCENE 3 At a sleepover Todd is staying all night at your house. You are playing with your brand new PS 2. You have been taking turns. Todd messes up bad during his turn. He tells you that he gets to go again because he messed up. WHAT DO YOU DO? • Let Todd have another turn. • Tell Todd “that’s not fair” because you’re taking turns. 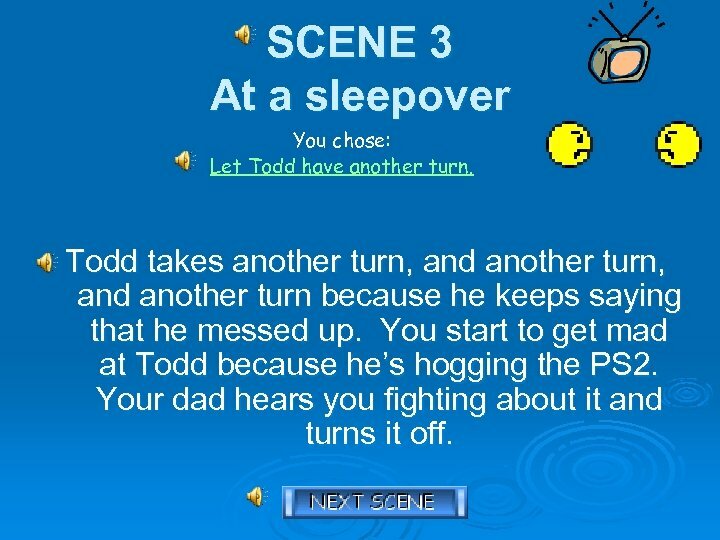 SCENE 3 At a sleepover You chose: Let Todd have another turn. Todd takes another turn, and another turn because he keeps saying that he messed up. You start to get mad at Todd because he’s hogging the PS 2. Your dad hears you fighting about it and turns it off. 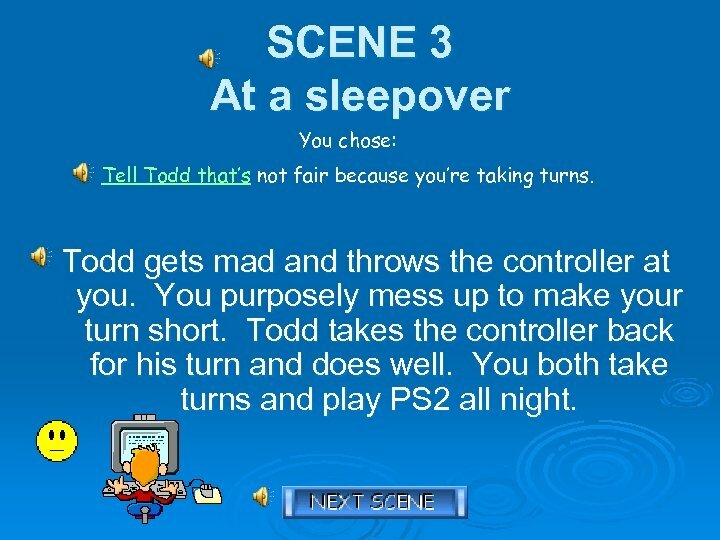 SCENE 3 At a sleepover You chose: Tell Todd that’s not fair because you’re taking turns. Todd gets mad and throws the controller at you. You purposely mess up to make your turn short. Todd takes the controller back for his turn and does well. You both take turns and play PS 2 all night. SCENE 4 At the park Patti, Kris, and you are playing at the park. Your mom told you to stay at the park. Patti and Kris want to go get ice cream across the street. Patti has enough money for you, too. They ask you to go with them. They tell you they won’t be gone long enough for anyone to know because it’s SO close. WHAT DO YOU DO? • Tell Patti and Kris that you can’t go. • Go with them because they won’t be long. 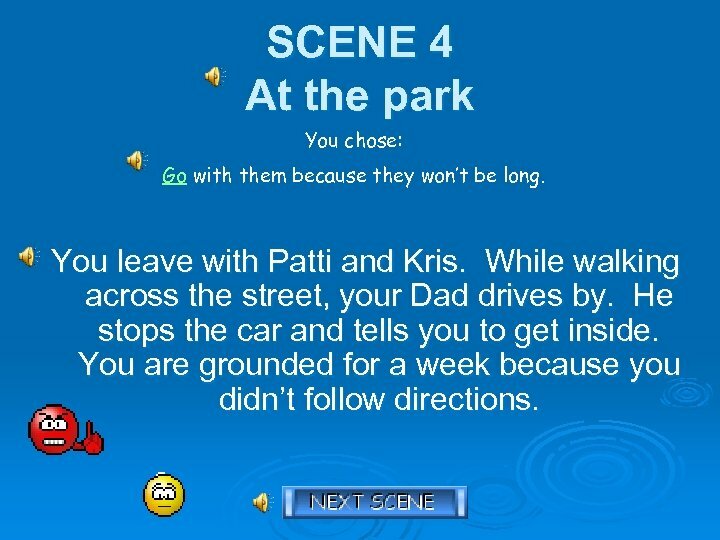 SCENE 4 At the park You chose: Tell Patti and Kris that you can’t go. 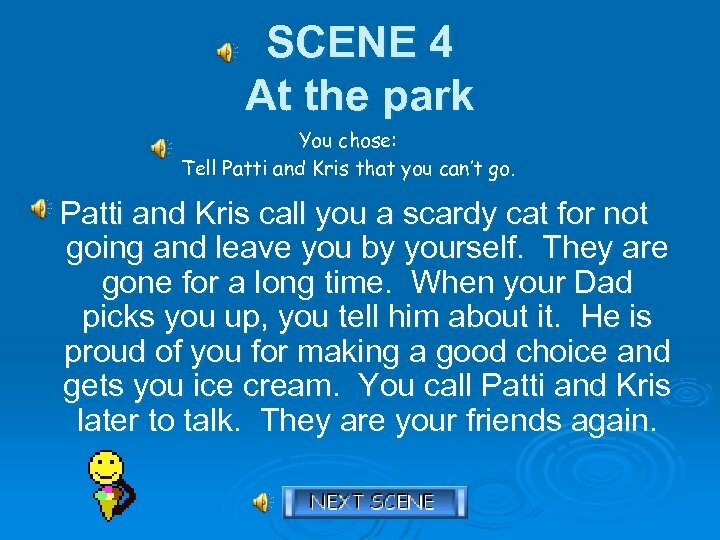 Patti and Kris call you a scardy cat for not going and leave you by yourself. They are gone for a long time. When your Dad picks you up, you tell him about it. He is proud of you for making a good choice and gets you ice cream. You call Patti and Kris later to talk. They are your friends again. SCENE 4 At the park You chose: Go with them because they won’t be long. You leave with Patti and Kris. While walking across the street, your Dad drives by. He stops the car and tells you to get inside. You are grounded for a week because you didn’t follow directions. SCENE 5 During art class Your best friend Brad is throwing wet paper towel balls at people, making you laugh. One accidentally hits Sue in the eye. Sue tells the teacher that your other best friend Jess did it. You are the only one who saw Brad do it. WHAT DO YOU DO? • Tell the teacher that Brad really did it. • Don’t say anything and let Jess get in trouble. SCENE 5 During art class You chose: Tell the teacher that Brad really did it. You raise your hand tell the teacher that Brad was the one who really threw it. Brad gets sent to the hall and doesn’t talk to you for 3 days. Jess plays with you every recess and gives you her new pencil, but you still are sorry about getting Brad in so much trouble. 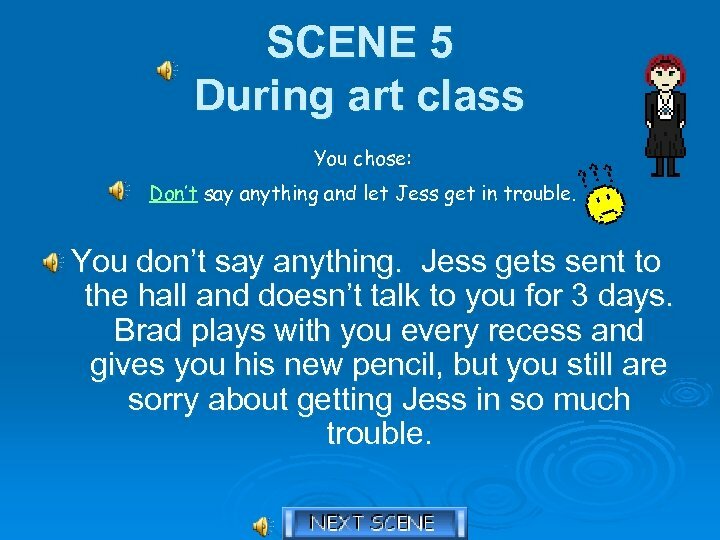 SCENE 5 During art class You chose: Don’t say anything and let Jess get in trouble. You don’t say anything. Jess gets sent to the hall and doesn’t talk to you for 3 days. 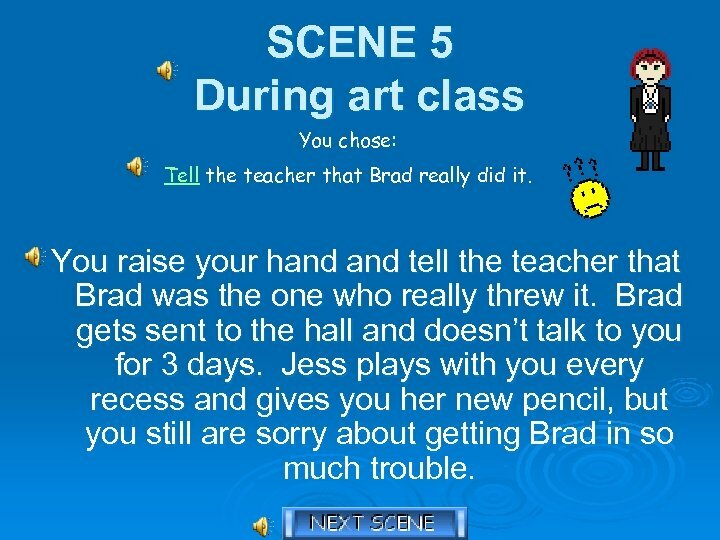 Brad plays with you every recess and gives you his new pencil, but you still are sorry about getting Jess in so much trouble. 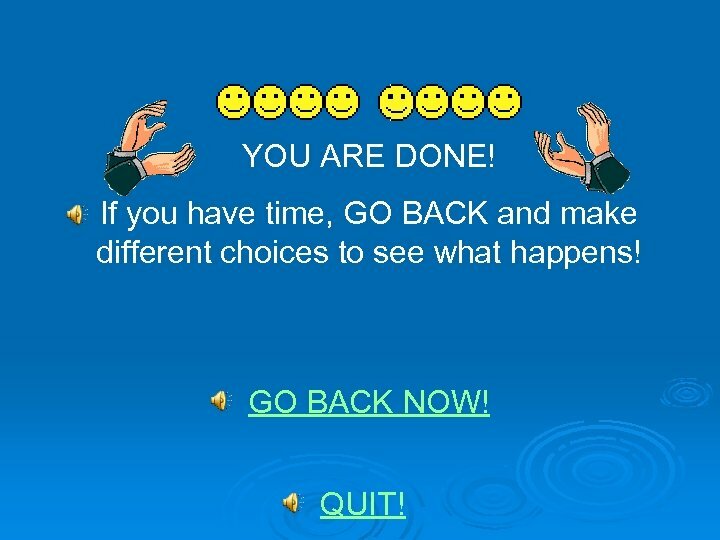 YOU ARE DONE! If you have time, GO BACK and make different choices to see what happens! GO BACK NOW! QUIT!